We had a calm and relatively dry morning for our May walk, with a soft green light and few biting bugs. It began with the beating wings of two circling swans and a chorus of warbling vireo, Baltimore orioles, yellow warblers, yellow throats, and the incessant creaking and calling of redwing blackbirds and grackles. Crab apple blossoms light up this dark day and perfume the air. Several new walkers were introduced to some of the history and various plant communities at Great Meadows: oak-pine forests, transitional lower slope woodlands, red maple swamp, shallow emergent marshlands, floodplain forest, and seepage areas. 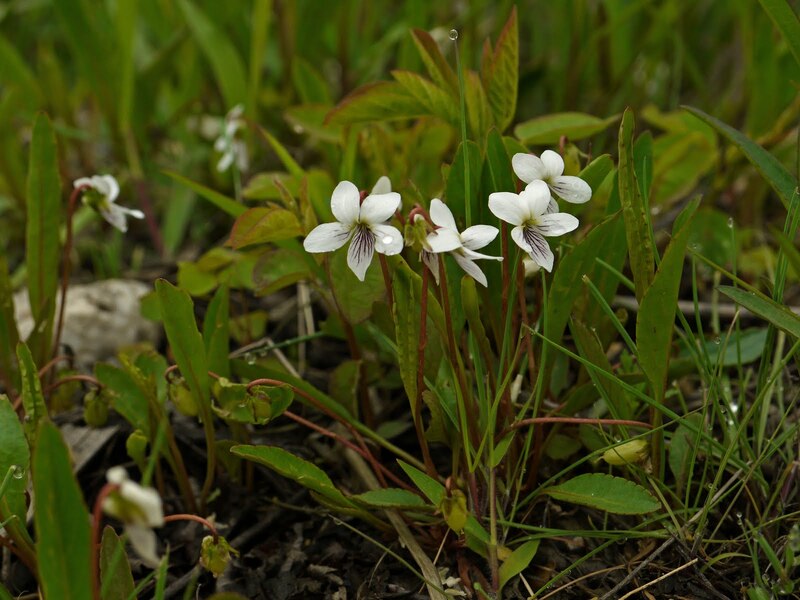 Some of the plant highlights included northern sweet gale, marsh equisetum or horsetail, emerging swamp dogwood and northern arrowwood leaves, highbush blueberry blossoms, various floodplain trees, and some early spring mustards including cuckoo flower, winter cress, and garlic mustard. Swallows were busy gathering low flying insects, chimney swifts were darting above the trees along the river, and a few new Canada goose goslings were out strolling with their watchful parents. 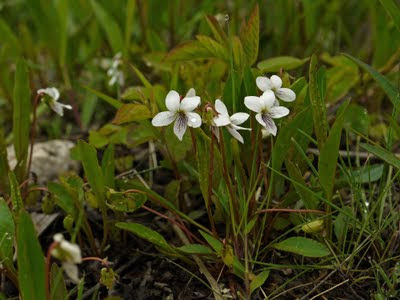 Walker Nancy Hartle discovered a small grouping of Bog violets on the eastbound segment of the dike trail (shown above), adding a new plant species to our Great Meadows list. Stay tuned for upcoming walk and program dates through the coming months! Sorry I missed it. I'll be looking for the bog violets.